In spite of the Pistons' considerable issues this season, Stan Van Gundy has been living up to expectations. Some of that is evident: the Pistons are tied for 18th in defensive efficiency this season, allowing 104.2 points per 100 possessions, up from 25th and 107.3, respectively, last season. The gains on defense are a direct result of SVG's defensive schemes and coherence. The offense, while it has performed worse than last season--some of which is SVG's fault (using Andre Drummond as a post player), though most of which is the fault of abhorrent shooting around the basket--has been expertly designed and tweaked. I'm cautiously optimistic that SVG is slowly implementing his schemes and making sure that the Pistons can execute what they've been assigned, but after 12 games, the lack of schematic development has been alarming. Patience is afforded, but SVG needs to start showing something new in the coming stretch of games before eyebrows are raised. As the season has progressed, that patience has proven well-founded. SVG has continued to develop his early-season schemes and the offense has started to grow because of it. 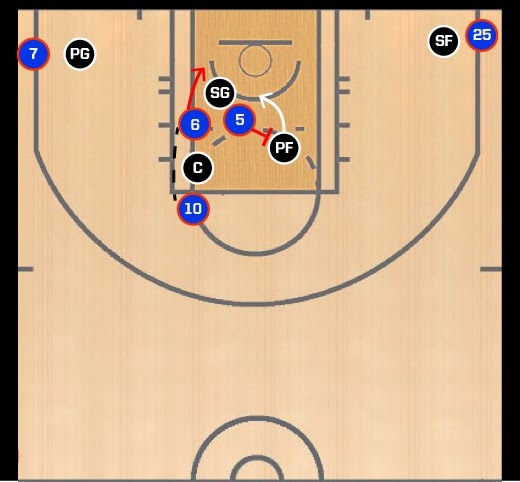 In Saturday's win against the Kings, the Pistons utilized the concepts of the above play in a more constructive method to generate easy looks at the rim. 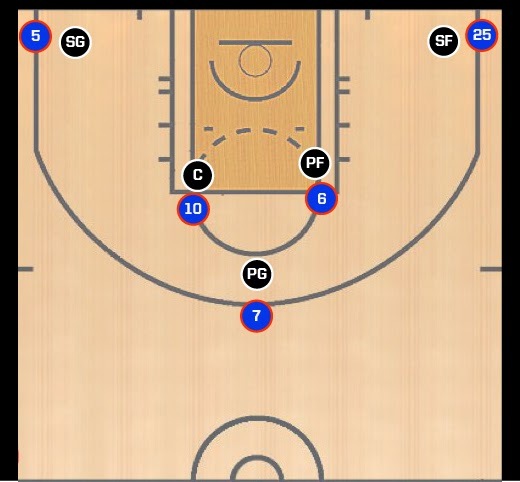 Brandon Jennings brings the ball up the floor and the Pistons align in the horns set. Greg Monroe, Josh Smith, KCP, and Kyle Singler are on the floor for this instance, but the play will work with any two-big lineup. Jennings immediately enters the ball to Monroe on the elbow and runs into the corner to screen KCP's defender. KCP curls from the corner and into the lane. In the future, Monroe may have the option to pass it to KCP in the lane, but that wasn't built into the play design in this game. Rather than cutting to the basket and looking for a pass from Monroe, KCP's job is to set a back screen on Smith's defender while Smith cuts through the lane. Monroe now makes an entry pass to Smith who is on the move toward the rim and whose defender is in a trail position. Smith's defender has to come from the opposite side of the paint. On this play, Smith pump faked to get his defender in the air to get an easy layup. Building blocks. Having KCP set screens on power forwards early in the season always seemed like a fool's errand. He doesn't have the size or strength to set a quality screen on big men, and the play itself failed to produce consistent (or even above average results). 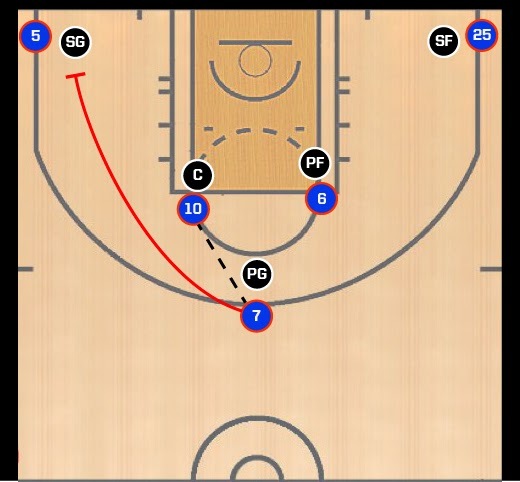 In the resulting weeks, SVG has shifted the Pistons' offense from a post-centric outfit to a perimeter-oriented, pick-and-roll scheme. But having perimeter players set screens for the team's bigs will remain a feature of the offense, however, and it's encouraging to see SVG utilize these fundamentals in more effective ways. More Smith. 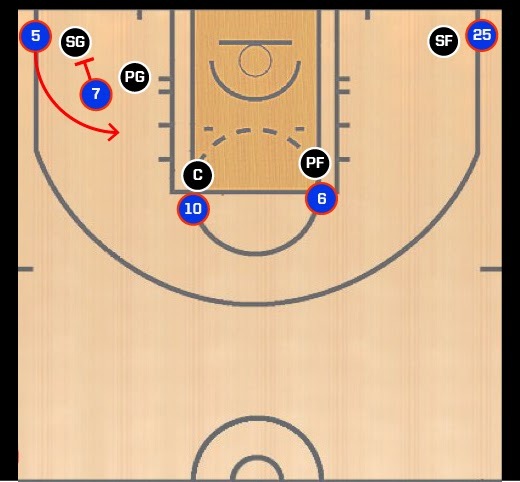 I've written before about Josh Smith's versatility and SVG's decision to center the offense's pick and roll on him. The primary tenet of these schemes is to get Smith on the move rather than standing on the perimeter and taking shots. 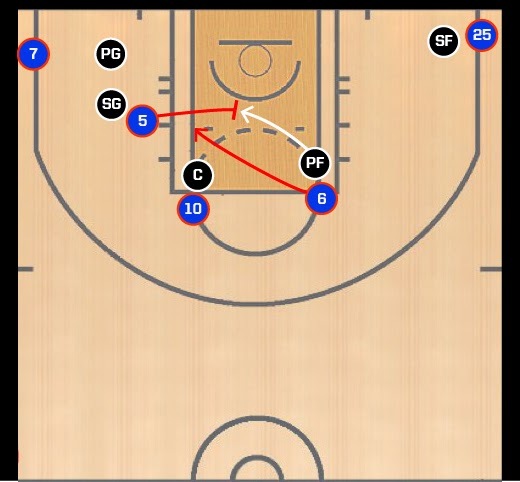 Though this play can be run with Drummond receiving the ball (and was a number of times in this game), Smith's skillset makes him dangerous in this scenario. If either corner defender leaves his man to help in the paint, Smith has the vision to find open shooters in the respective corner. Whether or not Smith becomes a consistently functional player on this roster or ends up traded, SVG will make lemonade when he has to. Systems take time. Most consider the Pistons better than their record. The early parts of this season were a disaster, in large part because SVG's schemes are complex and take a long time to implement. Putting plays onto the court without establishing the baseline of their effectiveness is a recipe for incoherence. This is why SVG says things like, "I want to get them to run back on defense tomorrow in a scrimmage", you can be sure that's not just coachspeak. SVG is actually starting from the baseline with this team. Growing pains are to be expected, but as the season wears on, the team will have a better grasp on and more intuitive understanding of the schemes. The Pistons cannot replay the first 24 games of this season in their current form. If they could, they would have more than 5 wins, of that I'm certain. The Vegas line before the season was 36.5 wins in a weak Eastern Conference. To hit the over, the Pistons would have to finish the season 32-26, a tall task but not out of the picture in the Eastern Conference. The Kings were without Demarcus Cousins, so take the last two wins with a grain of salt, but this may be the turn that the Pistons were bound to make. Salvaging this season carries the side effect of losing a high draft pick, but we'll cross that bridge if we come to it. For now, the Pistons are starting to develop into the team everyone expected at the beginning of the season. Anyway you look at it, that's a good thing.